This is the Plas Teg Bellpull from the Mary Jane Collection (2 feet by 6 inches). I’ve had this for a while. I was so excited about this design that I went and got the floss for it, even though I cannot possibly start it until I finish some (many) projects. I can pull it out and look at it though. It also has a color list for Caron Impressions wool/silk blend, but I can’t afford that, and it’ll be beautiful regardless. I should note that I changed the colors slightly – I chose a bolder shade for almost every color. I like very bright colors. 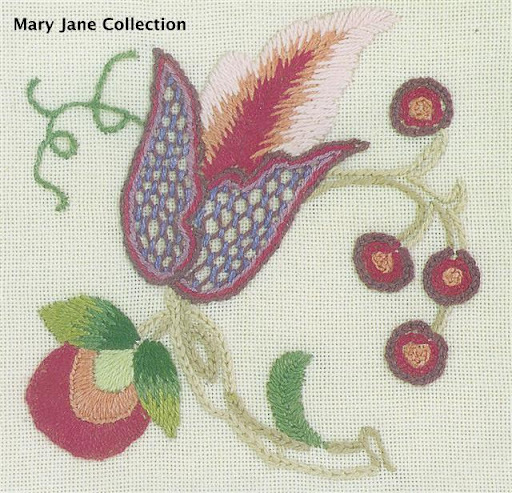 I mentioned the Mary Jane Collection’s goldwork in a previous post, and their crewel designs are just as amazing. The Plas Teg bellpull is one of four bellpull designs. They also have a range of 5×7 inch kits, a range of 4.5 inch square tiles, and a few other designs of varying size. The two smaller kits pictured here are the 4.5 square tile size. It’s a UK company, but US folks can find some of their kits and chartpacks at Stitchers’ Paradise or Needlework Corner. 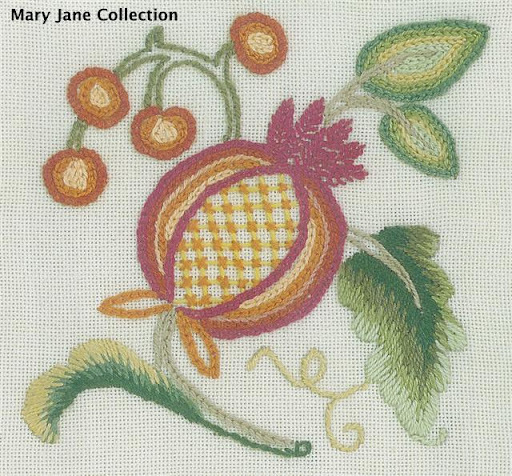 This entry was posted in Crewel, Design sites, My work and tagged crewel, embroidery, Jacobean, Mary Jane Collection. Bookmark the permalink. Hi, I was wondering what type of floss you are going to use? The numbers don’t appear to be DMC, so is that silk floss that you’ve chosen? Are the colors overdyes, or solids? Your colors are beautiful. Looking forward to your progress on this piece. They actually are DMC. The letters in front of the numbers are just the symbols from the diagram in the instructions for easy reference. “DP = dark pink” for example. What a beautiful piece. Inspires me to look for a bell pull. I don’t have a bell to pull, but the design is SO beautiful, and your work is just incredible. I don’t have a bell either, but I guess I should start looking for one! Work the bell-pull and then go look for the bell – it will need to have the right proportions! Reached your website through Bing. You already know I am signing up to your feed.